Does anyone know if there has been any replica Hallstatt daggers made? See attached picture. If so are they available to purchase? Does anyone have any pictures? Are there any other Celtic daggers or knives, perhaps from the La Tène period or other periods? Doing a quick search online only brings up Hallstatt daggers. The Celts must have used daggers and knives in other periods also. Anyone have any pictures they are willing to share. I would especially love to see large colour pictures of the 3 daggers I have posted plus any others. I don't know about the Hallstatt types, I havened founded them yet . This one is surely acurate because the guy who makes these is an archaeologist himself. If i can think of something more, i'll let you know. And if you do find something, please let me know. You could of course have one custom made as well. Does anyone know if the picture attached of Celtic long / war knives are accurate replicas or not? They can be found at the following websites? Are there any other replica war knives out there? I don't know iron age blades that much to judge their accuracy. However, the bronze swords on the second site are way off. The bird head knife does look quite nice though, and they do claim it's an accurate copy (though of course that doesn't say anything). To me only the left one lookes a bit accurate for something La Tene. Bud thanks to this splendid (myArmoury) site and it's "inhabitants" I own now a couple of nice books with good Celtic info and graphics. So I gues it's a good thing that I put them to use here also, and show you the images I can come up with. 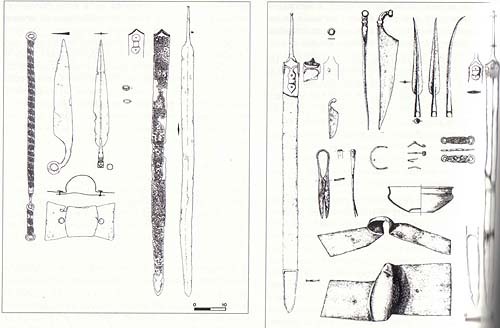 Besides this images, I think it's also good to bare in mind that these kind of knifes where also found in Celtic burials together with a pease of mead on a plate. The comment about the find details is *very* worth noting. These knives are usually not found in the grave in a way that indicates they are war knives at all, in the most common case. They are almost never placed "close to hand", like the swords, spears, javelins and shield fittings and other "war gear". 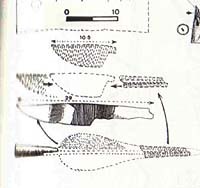 What's worth noting though is that even in the iron age, flint flakes were still used in lots of areas as cutting tools. Knives were probably luxury items for the more wealthy. Naw, they're just raw forged blades, with the grinding left away. I personally prefer that over something that's been ground to a mirror finish on a modern grinder. At least it gives the option to grind it using authentic means. 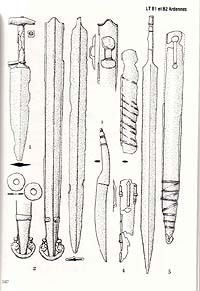 I guess my point though is that these were not left raw forged, evrything cutlery wise seems to have been ground and polished in period, and some of the razors, swords and knives retain quite a nice finish, where preserved by submersion or an anoxic environment. It would no have been left completely raw-forged in period, I believe. Getting to this one a bit late, but oh well. A good range of knives has been covered here and at this point it is probably best to try to look at them more independately to be studied indepth. 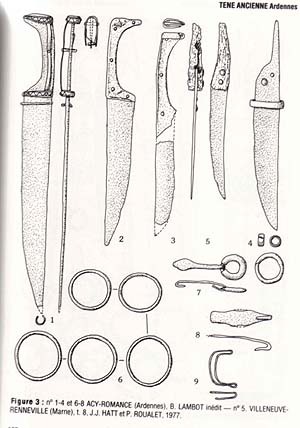 In the grouping of modern produced examples, I have always wondered about the source for the middle bird headed knife. Hard to tell size from the pics, but the two on the right it larger might even be attempts at a machaira, falcata, or kopis. Everyone has their own taste, but I just find it hard to do the rough look with the la tene objects. So much time with finishing and the artistry went into their objects that it just seems almost hard to see things that don't have the same level as being la tene. Of all things, the woodworking seems to get me the most though. You don't need all the modern equipment and sand papers to get a good finish on wood, all it really takes is a simple wood scraper. All those even are is a piece of sheet metal with a bur on the edge. You don't need all the modern equipment and sand papers to get a good finish on wood, all it really takes is a simple wood scraper. All those even are is a piece of sheet metal with a bur on the edge. I am afraid one needs quiet some woodworking experience to achieve something with that little a tools. At least I do, I need all the tools I can get!! Ok, where is a link to what I'm talking about. I never dreamed how useful something so simple could be, but they are literally pieces of sheet metal with a slight bur. It takes off shavings much like a wood plane, but much thinner. They are flexible which helps with curves. Just great for scabbards, works great to do the last 10% or so of shaping. A good teacher is always helpful, I worked for several months with Mark Grzybowski now of http://www.ollinsworddesign.com/, and he helped me so much with my wood working. He can really do magic with a piece of wood, well and steel, wax, styrofoam, and about any other medium he goes after. Going back to my original post and the picture of the 3 Hallstatt daggers, have you come across any other daggers from other periods (La Tène etc), which are as impressive in relation to the hilt design and ornamentation? If not has there been any discussion by experts or others as to why the Hallstatt period appears to have such impressive examples of daggers while other periods do not? Lastly I don't suppose you have any pictures of Celtic daggers including some nice colour pics of the 3 Hallstatt daggers? Everyone has their own taste, but I just find it hard to do the rough look with the la tene objects. So much time with finishing and the artistry went into their objects that it just seems almost hard to see things that don't have the same level as being la tene. Thanks! I recognize similar bronze age tools. There's various examples of thin sheets with sharpened edges, which I expected might have been used for wood working. Even in the bronze age, some very delicately finished wooden/bone etc. hilts were made. 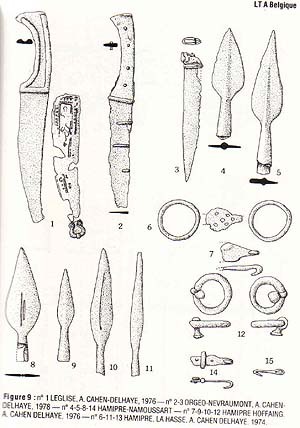 If they could do it back then, with the simple tools they had available, they definately could in later periods with better and more specialized tools. Of course that doesn't guarantee that they always did though. Posted: Wed 15 Jun, 2005 4:11 am Post subject: Take a look here. This is an interresting site. Posted: Wed 15 Jun, 2005 6:54 am Post subject: Re: Take a look here. €80 for a spear? Is this for real?